Join us for a fun evening of food, dancing, socializing and the chance to win some Moolah! 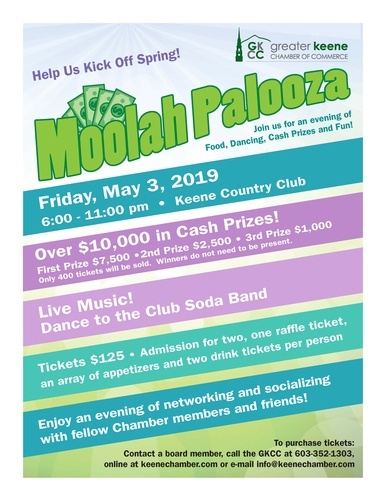 Support the Greater Keene Chamber of Commerce Moolah Palooza by purchasing your ticket today! Only 400 tickets sold! You don't have to be present to win! Bring Cash for 50/50 Raffle tickets to be sold at event! A portion of the proceeds will be donated to a local non-profit organization. Purchase a ticket online or visit the Chamber at 48 Central Square.